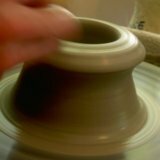 These two pottery techniques are where the magic begins. This is where a lump of clay becomes a work of art. For the first pull, make a "C" shape with your left hand. Use your hand like a crab claw, fingers inside the pot, thumb on the outside. Drizzle some water over the rim using a sponge. Starting at the bottom of the wall, squeeze your thumb and fingers gently together through the clay. A bulge of clay will form above where your are squeezing. 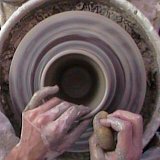 Slowly and steadily pull the clay upward through the wall toward the top of the pot. As with most of the pottery techniques we have learned, add water as needed so you don't stick to the clay. Continue pulling up, lessening the pressure as your fingers rise, until your thumb is half an inch from the top. Then, slowly release your grip. Leave some extra clay on the rim so you don't tear through it. Now that the walls are growing taller we'll use a different pottery technique, which allows your hand to reach further down into the pot. We'll use both hands now. Your left hand goes inside the pot, while your right hand goes on the outside. Continue to use the fingers of your left hand as on the first technique. Replace your thumb on the outside with the finger tips of your right hand. Holding a sponge in your right hand, press your fingertips through the sponge against the base of the pot. The sponge helps to prevent you from sticking to the pot. It allows you to throw longer without adding water. Now, hold the sponge steady as the wheel turns. Very slowly bring your hands up the side of the pot. Press gently into the wall. Your left hand is mostly just supporting the wall from the inside. Most of the pressure will be with the sponge in your right hand. Again, leave the rim a bit thicker to add support to the walls. Be sure to keep the walls wet inside and out. Repeat this pulling process until the walls are about 1 cm thick (thicker is okay on your first few pots). Later you'll work toward getting them about 3/4 cm thick. In some cases you'll go even thinner. 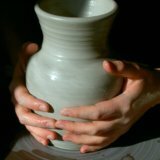 This will enable you to create nice light-weight bowls, mugs and vases. You'll notice that at the bottom of the wall where the clay is thicker, it will require more pressure from your fingers. However, as you move toward the top of the wall you'll need a more and more delicate touch to keep from collapsing the walls. Finally, shape the walls of the pot. Use the same hand position as with thinning. Only now, depending on the shape of the pot press harder from the inside or outside. For a bowl, gently pull the entire wall open with the left hand, while supporting it on the outside with right hand. Great Job! It's really starting to look like a pot now. Take your time on this step. 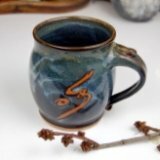 It's one of the toughest, but most important of the pottery techniques you will learn. It won't be perfect right away, so keep practicing. If your rim is wobbly at this point, it's okay. In the next step we'll work on trimming and finishing the rim.